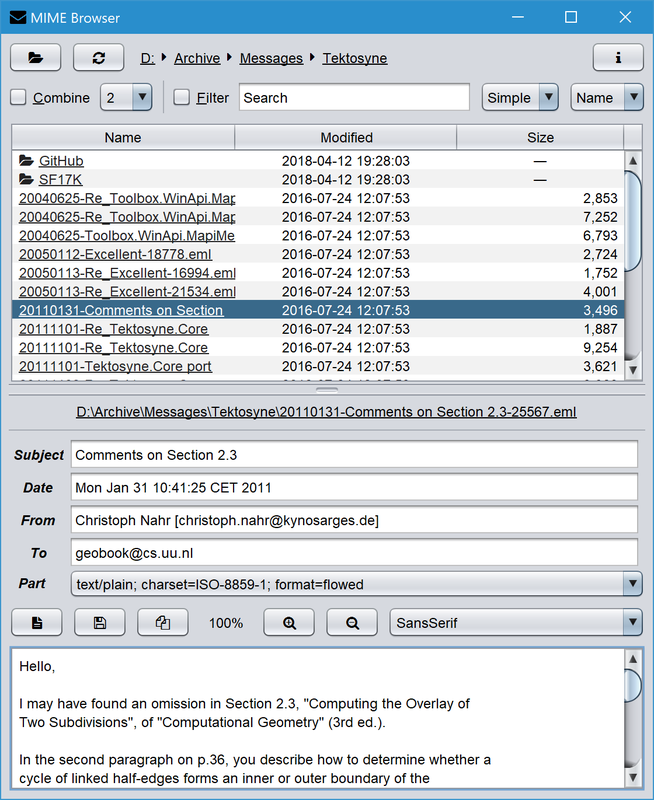 Version 2.0 of MIME Browser, my free EML message viewer, is now available for download. The big change is the one motivated by the removal of JavaFX from Oracle’s Java SE distributions: MIME Browser is now based on Java AWT/Swing rather than JavaFX. The user interface has become somewhat uglier as a result (below is a screenshot using the Nimbus Look & Feel) but I was able to recreate nearly the entire JavaFX functionality. The major exception is the HTML view. Whereas JavaFX provided an entire wrapped WebKit browser, I had to substitute CSSBox in the Swing version to avoid dependence on some big native library. CSSBox is an impressive project, written in pure cross-platform Java and only 3 MB with all dependencies, but there are inevitable drawbacks compared to a full web browser. Complex pages may take seconds to display, and may not display correctly. The following browser features are unsupported: selecting & copying text, clicking on links, and changing the zoom level. Still, the EML messages I tested produced readable text so this should serve well enough. There are some minor enhancements, too. A new image viewer displays image parts of EML messages. The font drop-down box now shows each font name in its own typeface, and filters out symbol fonts. And the minimum Java requirement was lowered to Java SE 8, although note that you still need Java SE 9 or later to get high DPI scaling. See the updated ReadMe and WhatsNew files for details.